The Milton Friedman Award is given every two years since 2002 to the person who has represented the best the fight for individual rights and freedom. This year in what can only be considered a stunning move, the winner is Yon Goicochea, the most prominent leader of the student movement through 2007. Venezuelan Student leader Yon Goicochea informs the students about the events during a rally against the Chavez referendum last year. 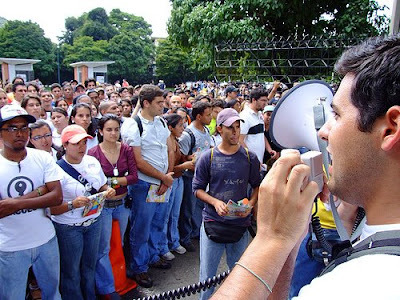 Goicoechea, leader of the pro-democracy student movement in Venezuela, successfully prevented President Hugo Chávez’s regime from seizing broad dictatorial powers in December 2007.